1. Crumble up your tights and tie them up with with rubber bands. 2. 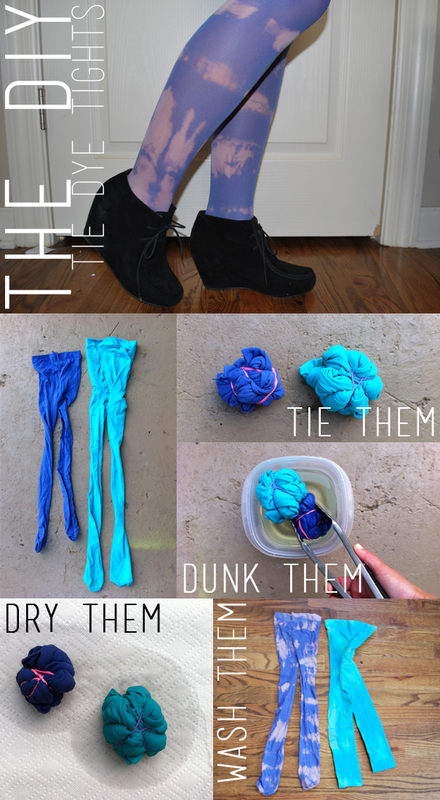 Dunk the tights in a bowl of bleach. Make sure every part of the fabric is being drenched in bleach. Let them sit for about 30 minutes. 3. Set the tights out to dry. 4. Once the tights have dried completely, wash them as you normally would and wear them! Bleach breaks down lycra VERY quickly. You're better going the other direction...adding dye to light coloured tights. Otherwise those bad boys are only going to be good for one to two wears, which is expensive at $10+ a pop. These are sooo cute, I could have a lot of fun with these. Shh... I'm imagining the possibilities right now!